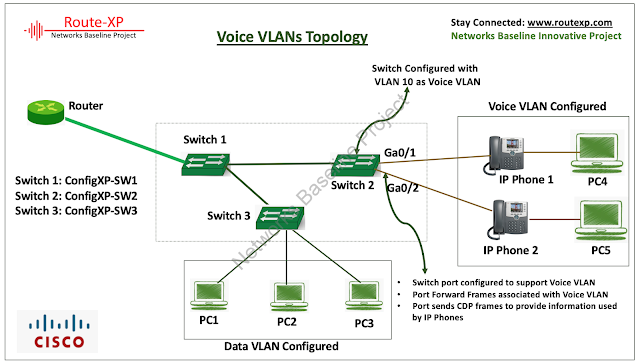 Today I am going to talk about the basics of configuring Voice VLANs in the LAN network. 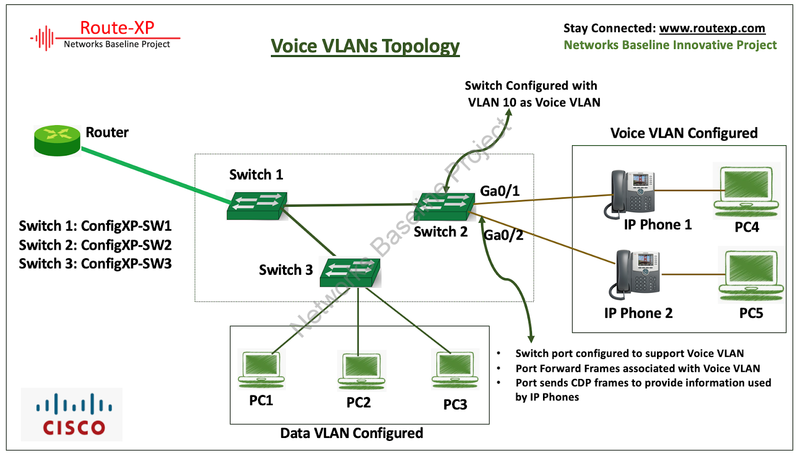 So, what does Voice VLAN means, Voice VLAN permits to enhance VoIP service by configuring ports to carry IP Voice traffic from IP phones on a specific VLAN.We can configure VLANs on which voice IP traffic is forwarded. Why we required Voice VLANs in the LAN network? As i talked about above that the voice VLAN feature permits access ports to carry IP voice traffic from an IP phone. Let us suppose a switch is connected to an IP phone and the phone directs voice traffic with Layer 3 IP precedence and Layer 2 class of service values, which are both set to 5 by default. Because the sound quality of an IP phone call can deteriorate if the data is unevenly sent, the switch supports quality of service (QoS) based on IEEE 802.1p CoS. So, we can configure an access port with an attached IP Phone to use one VLAN for voice traffic and another VLAN for data traffic from a device attached to the phone. You can configure access ports on the switch to send Cisco Discovery Protocol (CDP) packets that instruct an attached phone to send voice traffic to the switch. The voice VLAN feature is disabled by default and you need to configure on the switch. Another important information about the voice VLAN that it is only supported on the access ports and is not supported on any of the trunk port configured on the switches.